Is My Rolex a Fake? It’s Friday afternoon and you have dropped by the local hangout with some friends from work. On the way there, you were approached by someone who claimed to have genuine Rolex watches for a huge discount. Already you are suspicious, but you decide to indulge the poor soul who you think is just trying to make a living. As he unfolds the sapphire colored velveteen material, giving the illusion of royalty being the previous owner, you see these impressive looking watches. The problem now is trying to figure out if the merchandise before you is actually real or fake. This little scenario is one that has been touted over the years many times. Whether it is seen in the movies or real life, it is an experience some have had. But, let’s put this into perspective and consider that the opportunity for you make a legitimate purchase from a dealer presents itself. For anyone who has desired the feel and look of a Rolex on their wrist, the compulsion to make that purchase can be intoxicating. To the buyer, beware. There are some considerations that become essential before going down that engrossing road of a Rolex purchase. To protect the initial investment of such an endeavor, a certain amount of knowledge is valuable, indeed, incredibly valuable. If the luxury of locating an expert on Rolex watches is available, take full advantage of getting his or her advice on any watch you are considering. In fact, it is safe to say that most “legitimate” Rolex dealers will have at least one person on staff who can divulge all of the details of the watch, and how they are significant in being able to identify an authentic Rolex. By far, this is the best advice, suggestion, reminder, etc. anyone can provide. Take Care of that Rolex! Spending any time at all researching and deciding on whether to invest in a Rolex or not is extremely wise. With such an investment comes the need for understanding how it retains and increases its value over time. This not only establishes a baseline from which you can monitor the growth of your valuable investment, but it provides necessary information for developing a timeline of when you want to receive the dividends for your patience and wise choices. Part of the care a Rolex watch needs actually has to do with using it. Wearing the watch is part of its design. The movement of your wrist works as a motion that winds the watch, thereby keeping it in working order. Some may choose to wear the luxury watch on rare occasions to avoid lack of motion and any kind of routine for seeing that it stays wound up. Furthermore, taking into consideration the purpose of purchasing the Rolex, extra care may be required to see that no scratches or other damage occurs to devalue the investment. However, not using the watch at all would require a disciplined routine that keeps the watch working and not just sitting for long periods of time with no movement of the mechanisms inside. In fact, by allowing the watch to stop and not run for periods of time will damage the watch via stagnant gears. One suggestion is to identify a Rolex expert and discuss with them a recommended care and maintenance plan for protecting the watch from any kind of unintentional damage or misuse. Being knowledgeable about the Rolex can only help to ensure its care and longevity for the current owner and someone who will invest at some future time. A Rolex watch is durable, luxurious, and designed for use in elegant and active environments. Frankly, it is entirely up to the owner as to what he or she plans to do as a strategy for protecting their watch investment. Above all else, having a long-term plan in place on how the watch will be used, if it is to be used at all, and what they expect for a fair return is indicative of a very smart and conscientious investor. Someone like this is destined for a wonderful and exciting retirement. A Rolex Is Not Just Another Watch! Over the past century or so, Rolex watches have been making a real name within the watchmaker’s community. Starting out with a few fancy watches, this organization has taken their name to new heights and branded the Rolex as one to not only own, but to become competitive. This driven by other watchmaking companies have driven this market to where hundreds of different kinds of watches, even luxury watches is being built and marketed. The intricacies in its design, its mechanisms, and its overall durability have made Rolex a target in just about every genre of watches. However, what else sets apart this extravagant watch from the others? Is its popularity or is it the sheer number of varied products within the Rolex name? Whatever the reason, this has only added to its name recognition worldwide. Additionally, this watch is constantly battling with organizations that create fake Rolex watches in attempts to charge enormous prices for their flawed product in hopes to cash in on the brand name. Unfortunately, this has happened a lot and many unsuspecting consumers, and in some cases a little naive, are the victims of fraud and don’t realize it until it is too late. Getting a great deal on a Rolex does not have to happen out of the trunk of a beat up Pinto or the coat pockets of a passer-by. Keep your wits about you when it comes to seeking out a great deal on a Rolex. Identifying a dealer who knows how to treat its customers and provide them with knowledgeable service staff is the beginning to earning a potential customer’s business. 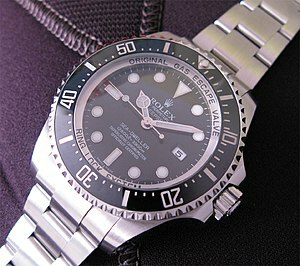 The local Boca Raton pawnshops are a great place to get a fantastic deal on a genuine Rolex watch. Ask for the signs of identifying a fake Rolex. Be very insistent on getting all of the information you can to make an educated decision on this kind of a purchase. In fact, look up tips on how to spot a less than genuine Rolex by searching the internet; plenty of information is readily available for your perusal. Enjoy the opportunity of owning a Rolex and trust in a dealer who can earn the business of a serious client. Boca Pawn Shop – shopping for watches. Sell or Buy Watches at your local pawn shop! Image, courtesy of Wikipedia, GNU free documentation license. Let me put it to you like this, with Christmas closer than you may think, now would be a great opportunity to buy for your special someone before they even suspect you are looking. What a perfect cover, especially if you are the typical last minute shopper. Shock them with the watch and the fact that you shopped so early; all just for them. Besides, what better way help your budget in these tough times than to find exactly what you are looking for with such a huge price break? Perhaps, you are on the other end of the spectrum and need the cash for other needs; even better, because this is a market for a seller as well. Don’t hesitate to sell a watch, don’t stall, don’t procrastinate; just get up and stroll on down to take advantage of a fantastic opportunity to provide a quality watch for a future client and earn some much needed cash for you. This is a win-win no matter how you slice it. Put on your happy face and enjoy the browsing as a buyer; feel the comfort of getting cash you need as a seller. Remember, either way, you are the winner!